Sometimes I have trouble writing the blog posts. So, I can get a bit behind. Jennifer said I have Writer’s Block. But, I call it Banana Block since I can’t keep thinking of bananas. Ivan, Jennifer and I had to wake up extra early on the morning of November 14, 2008. 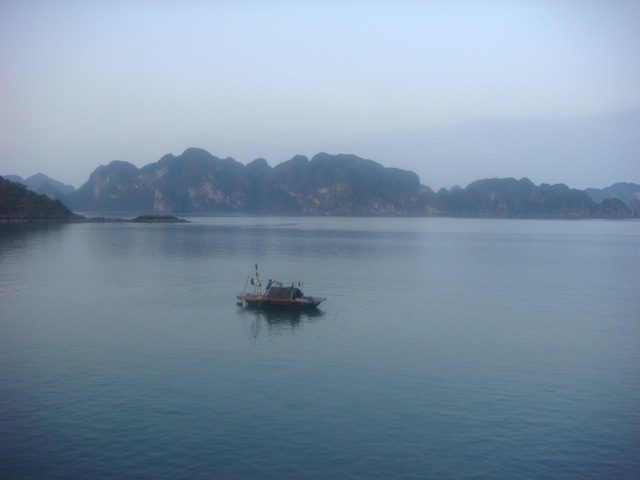 We were picked up at 8 am for our 3 day Halong Bay boat trip. Jennifer and I packed last night. She made sure she had enough clothes and of course bananas for me. We climbed aboard the bus. It was a group of 15 people and one monkey. The tour guide had everybody introduce ourselves. There was quite a few Australians on the trip. Our bus ride was uneventful. It was a long 3 1/2 hour ride. We did stop for a bathroom break for about 20 minutes as well. We reached the port. We had to wait a few minutes for the boat to arrive. There were so many boats in the water. We had to climb on other boats before we boarded our boat. We got on the boat and then were assigned our rooms. There was a nice top deck with lots of chairs. We chilled there chatting while we waited for lunch. We had lunch which was Vietnamese family style. It was decent. Our boat moved towards Halong Bay. The views were absolutely stunning. 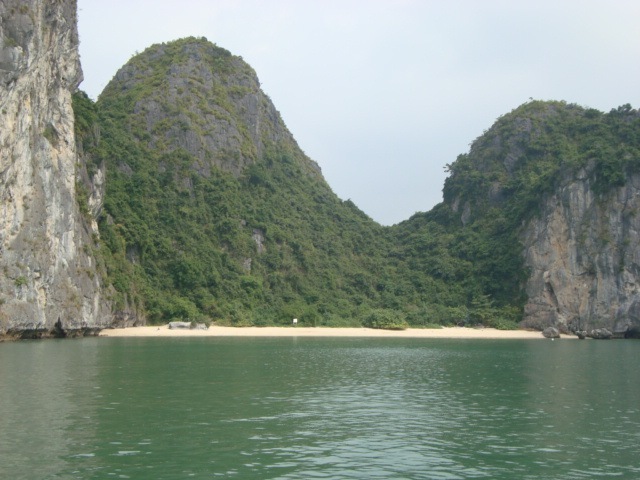 There were hills similar to the ones in Guilin, China. We picked up our kayaks. Then we rode off to where we’d be kayaking. Everybody got into pairs and went inside their kayak. I sat on Jennifer’s lap. 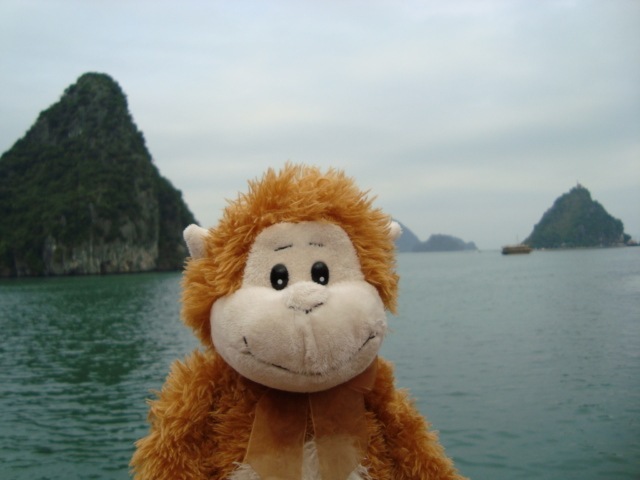 I guess the tour guide thought monkeys couldn’t row. I asked about a small monkey kayak. But, they didn’t have one. Jennifer had never kayaked before. It was hard since the oar was made out of wood. She had to take a rest since she’d get tired really easy. 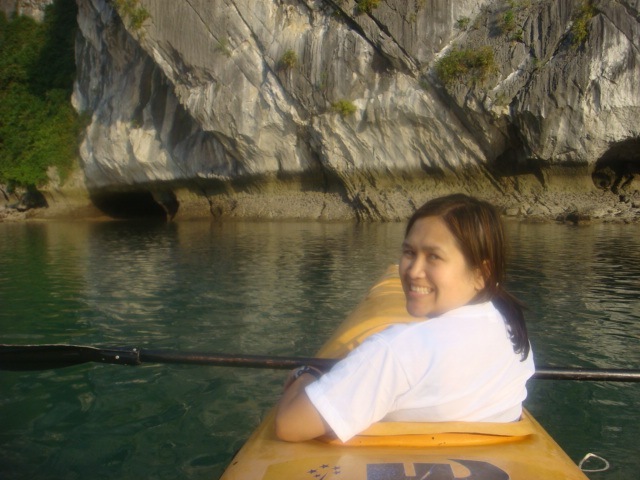 It was great kayaking in Halong Bay. It was very quiet and peaceful. We rowed around for awhile. We rowed back to the boat. We went back to the top deck to relax for awhile. It really was beautiful in Halong Bay. There was an iPod dock with speakers on the deck. Ivan and Jennifer had their iPods and were playing some music. The guide said we could swim. But, it was dark already and I bet the water would be cold. So, nobody went in. Some of the Australian guys started a drinking game called King’s Cup. Ivan and Jennifer told me it was a complicated drinking game. We had some dinner. It was good again. The Australian guys asked Ivan and Jennifer if they’d like to join the game. They agreed. King’s Cup is a drinking game where you put the cards around the cup. Everybody has a drink like beer or a cocktail. When a person pulls a King card he puts some of his drink into the cup. Each card has a different rule like 6 is for chicks (where only girls drink). If you pull the last King card, you have to drink the King’s Cup. It was funny to watch Ivan and Jennifer play. It’s hard to remember all the rules since everybody keeps drinking more. I wonder if there’s a monkey drinking game like this. I was a bit sad to be drinking banana juice all night. They played three times. Jennifer didn’t have any luck since she lost the game twice in a row. Jennifer was getting drunk. Ivan was making sure that Jennifer didn’t go on the outer edge of the top deck. He didn’t want her to fall into the water. Jennifer kept dancing around the boat. She was even dancing on the table. It was quite humorous. There was a South African guy who kept calling Jennifer Vegas. Jennifer seems to fall when she’s drunk. 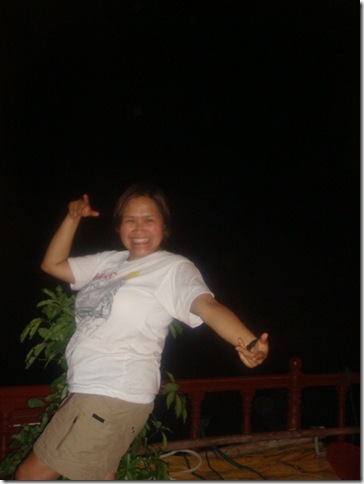 She kept doing these tai chi moves while she was dancing. It was a funny night. We were so tired that we crashed when we got to bed. We had to wake up very early on November 15, 2008. All of us had a great night’s sleep on the boat. We had breakfast at 7:30 am. I was happy to have a few bananas. We had to check out of our room by 9 am. The people who were doing the 2 day tour were going home on the same boat. 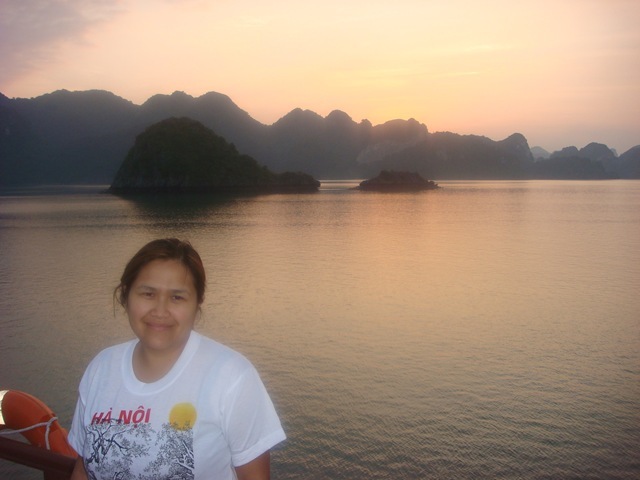 We were going on another boat since we had the 3 day tour. We packed up all our stuff and left the room. Ivan and I wandered the boat. 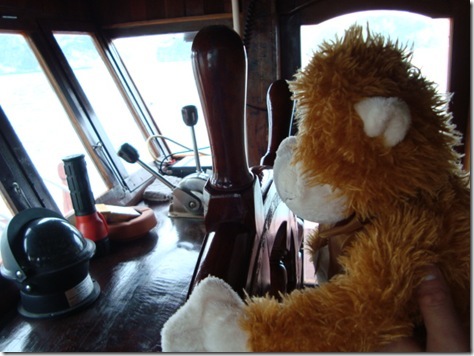 We even convinced the captain to let me drive the boat! It was good fun! We met the other boat and jumped aboard. Some people from their boat when on our boat. We met our new guide. It was a pretty Malaysian lady named Jess. Some of the group were going kayaking. The others had chosen to go rock climbing. I’m glad we were going kayaking. I like to climb but not on rocks. We set off in our kayaks. I was on Jennifer’s lap again. I did complain to Jess about the monkey kayaks. I think monkeys would come out and do this tour then. We saw houses out on the water. The owners had dogs. The dogs wouldn’t stop barking. It kept echoing in the bay. It wasn’t as quiet kayaking this time. Jennifer wasn’t feeling good. She was hungover from the previous night. It was more beautiful views. We went back to the boat and talked. We had some good lunch. We had the choice to either stay on the boat or watch the rock climbers on the beach. We stayed on the boat since we were so tired. Ivan and Jennifer read for a little while. We all fell asleep and took a nice nap. We sailed to Cat Ba Island. We checked in to the Phu Gia Hotel. We got to rest for awhile. We were going to meet the group for dinner at 7:30 pm. We had dinner at the restaurant. It was pizza, fries, spring rolls and chicken salad. I ordered a banana curry for me. Shortly after dinner, we walked back to the hotel. Jennifer and Ivan watched a movie. Then, we all went to sleep. Wow! 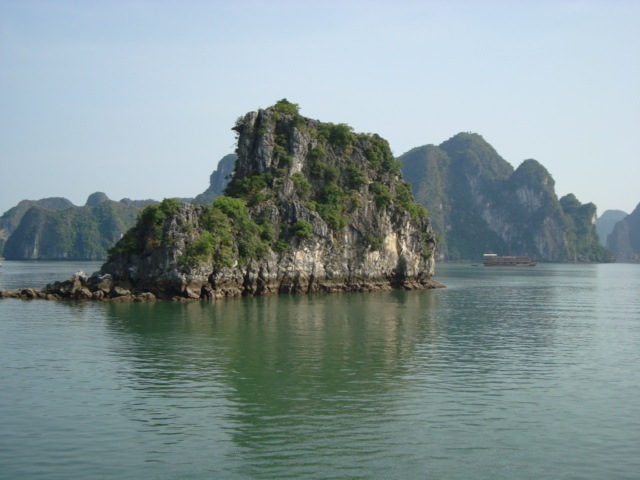 Those are some fantastic pictures of Halong Bay!